I will try to update this daily, for myself and others! This is my 10th time trying to quit, and i want to quit for good. Today I played a pc game and 2 mobile games for about 6 hours, i feel really bad. Good afternoon and good night! By the way, i live in south korea and had rubik's cubes as a hobby. I had around 40 of them but i lost them, and as i lost them all i quit that hobby and did gaming for 2.5 years. I was just looking into blocking software. Coldturkey blocks sites you want from everything, and you can get StayFocused for chrome. It's such a habit to go to those sites without even thinking. So if that's an option for you maybe try it. If you choose to use this, and want to block Youtube, then you need to add it to the blacklist because it is not there by default. Youtube is really tough to quit. I catch myself typing the Youtube URL into my computer through muscle memory a lot, particularly when I am sleepy. So I definitely wouldn't be able to avoid wasting time on it without blocking it somehow. I know those programs, but i usually view them on mobile, and most blocking apps cost real money to use effectively..
- You might want to separate YouTube out of your gaming detox. Yes, YouTube is a problem and it's also an inspiration for relapsing into gaming, but from personal experience (and those of other journals I follow), it's actually a lot harder to quit than games. I'm at nearly 120 days of no gaming, but I haven't been able to go off videos for more than 25 days. I would focus on not gaming (and maybe not watching gaming content on YouTube) first, then battle your video content problem once that's more or less under control. - There are some apps & extensions that can help with YouTube usage. Chrome has an extension called Block Site. You can come up with some random password and send it to a friend or a person on this forum. Yes, there are ways around it, but it's generally enough to keep me from just browsing to YT. There's also an extension that hides recommendations in YouTube, and can also remove comments so that all you see is the video you looked for and nothing else. THat's very helpful. And I definitely recommend getting rid of your channel subscriptions, YT history, and search history, and setting them to off so that your YT is always in "brand new" form. Do this even if you do decide to leave the YouTube detox for later. - Don't feel bad about failing. It might feel like you're not getting anywhere, but as long as you learn something about yourself every time, you're actually progressing. It might take a lot of learning before it enables you to actually detox. For example, if these friends are a bad influence, you should seriously consider distancing yourself from them. 1- but when I quit gaming, i just watch youtube when I am trying to not play games, and that deters me from studying. I agree that it's really hard to quit youtube, but i think I have to do it, i don't have much time left. But I will definitely remove all my google accounts to one, and delete all 300 subs. 3- I know I shouldn't be sad, but I relapsed over 10 times, and I can't afford to fail more, I have to do it within this month..
1 - I'd be very careful about setting deadlines like "this month". Addiction's a long, tough fight. I've been trying to quit for 10+ years. To be fair, I've actually started to make progress when I came to this forum and started a journal. Writing about it daily forced me to think about why I was addicted, what behaviors triggered my addiction, etc. But there's no fast & easy solution. But repeat failure is definitely part of the process. Plenty of guys on here have failed a ton of times, but if you look at how they're doing now compared to 6 months ago, it's night and day. In terms of YT and gaming, I don't have all the answers. My personal experience has been to quit gaming first and deal with the video addiction second, even though I did exactly what you said: resort to videos if games were not possible. I've seen some guys who are doing a gaming + gaming videos detox - they're allowed to watch videos, as long as they're not about games. I think that's a good first step because gaming videos are a common relapse trigger. @JustTom can weigh in on this more. 2 - Nothing foolproof that I'm aware of. My solution to wasting time on the phone has been to keep it in a different room (bedroom when I'm awake, office when I'm asleep). And I have a separate detox counter for not using the phone in the bathroom, which is what I used to do a lot. 3 - You have your whole life to fix this. I've found that the people who are successful in getting rid of this are people who learn how to fail. I've seen guys who fail a couple of times and just give up. Others have failed so many times (including myself), but just pick themselves up and try again every single time. The key is to learn something from each failure, set up the new detox in a way to deal with it. Over time you'll start noticing the changes. Overall I strongly encourage you to run a daily journal. Write about how you're doing, how you're feeling, the challenges you're facing, and what you're going to try to deal with them. It sounds lame, but it's incredible how useful it is in the long run. Others have failed so many times (including myself), but just pick themselves up and try again every single time. The key is to learn something from each failure, set up the new detox in a way to deal with it. Over time you'll start noticing the changes﻿. Just wanna second this badly is all. Never stop trying, remember that if you stopped trying the first time you had to try, you'd never walk, you'd still be crawling. Society makes us forget failure is part of the process, but it is. You try, you fail, you try, you fail, but every time you learn something from it. There's no way you won't learn it all if you keep trying, sooner or later you'll get there. Thanks guys so much for the support- such a great community- I will start day 2 of nogaming and start less youtube! Awesome! Free time is definitely a dangerous thing if you've got a tech addiction! Soo, I got the cube that i wanted, this will be my hobby for quite some time! Also this is Day 5 of nogaming, and productivity is rising! 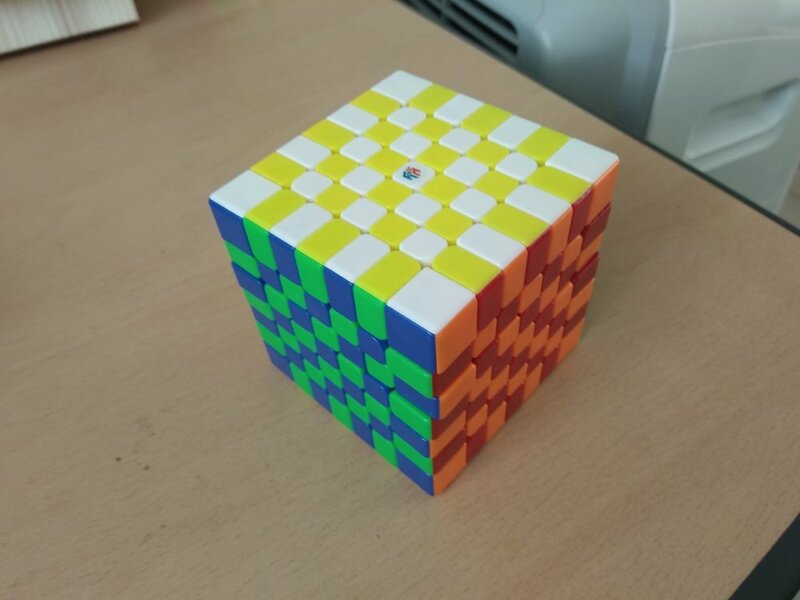 I like the fact that you're finding hobbies other than gaming, and holy f*** as a filthy casual 3x3 cuber myself that behemoth looks intimidating af. The only advice I'd have for you is to just make sure that you're getting enough human contact. I know you go to school so obviously you're meeting people there, but if your "fun time" for the foreseeable future consists of you cubing at home then it's possible you could relapse out of sheer boredom and loneliness. I see you've listed exercise and sports as one of your goals, and I think that's a wonderful idea. What kind of sports did you have in mind? Well I have been cubing for 3 years, but quit so it's not a new hobby but still good. I wanted to do some running when i am alone and soccer when i'm with friends. How'd you find out about this supercell game? What led you to relapse? You should analyze the events leading up to it so that you can make behavior changes to avoid them next time. So, I was watching youtube in my free times, then brawl stars popped up yesterday.... so I was like 'don't do it', and it worked for the first day. But then I got bored with my hobby the second day and i was really bored, so I went to the library to hope to do some studying. I did about 2 hours of math then did 2 hours of the game suddenly.